The hotel boasts 37 stylishly furnished rooms and suites that will satisfy the needs of all quests in order to have a relaxed and comfortable vacation. The single rooms, double rooms and deluxe studios are fully equipped with standard size beds, TV, direct dial telephone, air condition, mini bar, spacious bathroom and available room service. The hotel has its own restaurant as well as cocktail lounge setting where guests can enjoy delicious food or cocktails. The spacious terrace is also one of the features of the hotel as it provides lovely view of the Lake and the beautiful Dojran. The swimming pool and the conference hall are as well perfect for recreation or business meetings in Dojran. 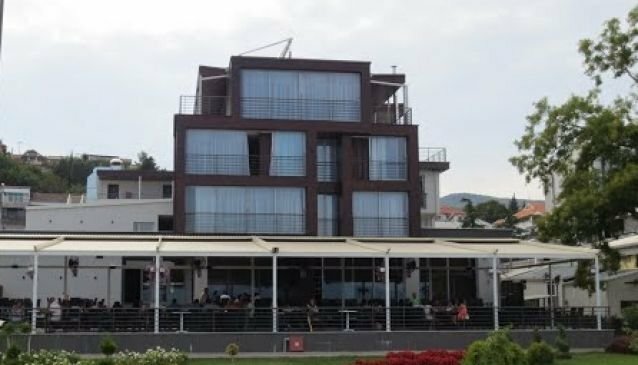 Hotel Romantique Dojran will not disappoint your expectations with its professional service and unique comfort.